Sponsored by U.S.K.A - P.K.C. - U.S.K.K. 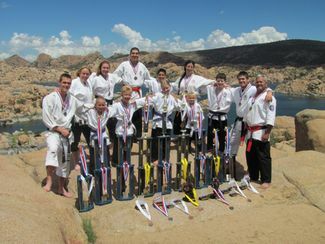 Prescott Valley’s own ShinpuRen Family Karate brings home 13 World Champion Titles. 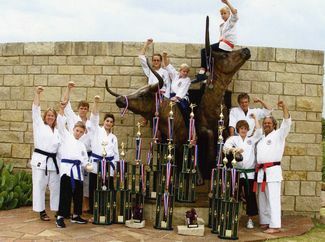 Nine Shinpu-Ren Family Karate students and four instructors returned from the World Karate Championships held in Dallas Texas with 13 World Champion Titles under their belts. The entire team brought home 60 top four placings and 38 of those were top 2, and 54 were top 3. Students spent weeks attending extra training classes to prepare for the four-day event. Competitors came from all over the globe to participate. One student, Jesse C. even received a team jacket from the Australian men’s team as a gift for, as he said, “The best Yank I ever fought.” Competitors from the school ranged in age from 7-46yrs. and ranked from beginner through fourth degree black belt. All of the students competed in 5 or more events. Three members of the schools team are students of the Prescott Valley Yavapai College Karate Class. One of them, Sherri P. entered 8 events and placed top two in 7 of them and third in her eighth event, she brought home three World Champion Titles. Tye G. was right behind her entering 7 events winning two World Champion Titles and placing second in all of the others. All four members of the teaching staff did quite well in their competitions and were able to add five Champion Titles to the total number achieved. All of the competitors worked relentlessly for months to earn the money to pay for their trip through fundraisers along with all of the extra training they did in order to attend this World Class Event. The students competed in up to eight events each in their divisions. Some of the divisions were quite large with as many as 30 competitors in them. In addition to doing so well in their own divisions, two of the schools instructors, Shihan Alex and Sensei Travis were honored to participate on one of the 2 competing teams in the Grand Champion Kata Bunkai Competition. This was a very unique experience for both of them and a lot of fun, especially when their teams competitor won the Title. Worlds features over 175 divisions and is open to all styles and competitors. Competitors compete in a division by age and rank. Many of the divisions run average of up to 30+ competitors. This year the school brought home a total of 62 top five placings. Prescott Valley Karate School, Shinpu-Ren Family Karate attends The USKA World Karate Championships in Dallas, Texas. In an amazing sweep, the nine member team traveled home with 17 World Champion Titles. They also brought with them 15 second place titles, two third place titles and one fifth place. Students competed in Kata (forms), Kumite (sparring), Koshiki (full contact fighting), Team Sparring, Continuous Sparring, Kobudo (weapons) and Chanbara (padded Sport Samurai Sword Fighting). In an incredible sweep of her division Natalie Yslas toted home five world Titles, and following close on her heels was Hannah Vanert with three Champion Titles of her own. Overall the team managed to bring back to Prescott 34 top three World Titles. 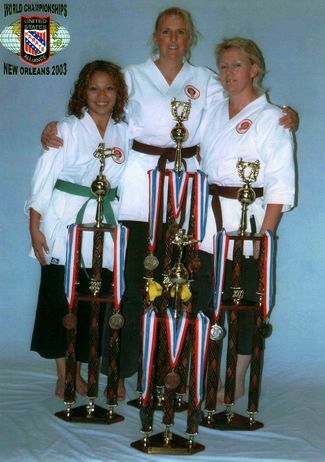 Three students of the Shinpu-Ren Family Karate School return from the United States Karate Alliance World Championships Tournament. The Tournament is a weeklong event held in New Orleans, Louisiana. Combined, the team entered 18 events. These events were, Kata, Kumite, Team Kumite, Full Contact Koshiki, Continuous Sparring and Chanbara. Of these 18 events, 17 of them yielded a top five placing.